Those looking for a touch of whimsy in their next LED lamp fixture will love product designer Chen Bikovski’s Popup Deer Head light. 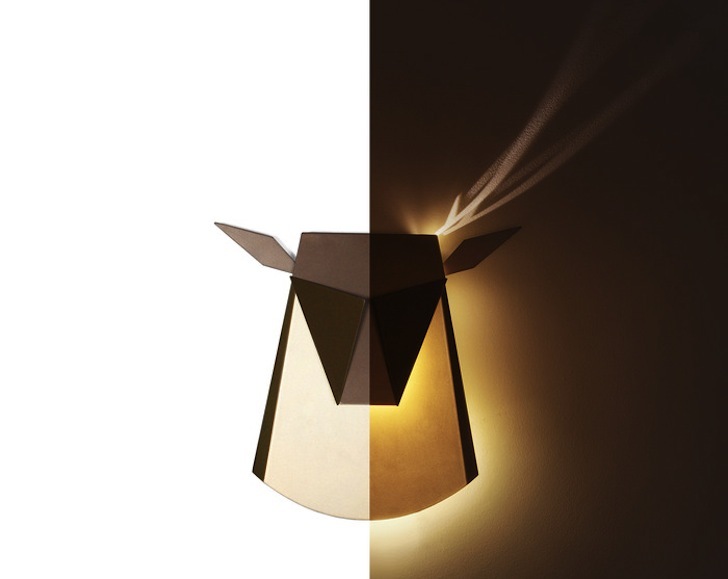 Inspired by popup books, her origami-like lamp transforms from elegant wall art into a contemporary deer head with the simple flip of the switch. Fractured beams of light shoot through the edges of the lamp to mimic a pair of dramatic antlers. Constructed from folded aluminum and steel, this elegant lamp gives a classic and timeless feel that makes it adaptable to a multitude of environments. Want one of your own? There’s still time to nab a lamp at a discount price over on Bikovski’s Kickstarter! Those looking for a touch of whimsy in their next LED lamp fixture will love product designer Chen Bikovski's Popup Deer Head light. Inspired by popup books, her origami-like lamp transforms from elegant wall art into a contemporary deer head with the simple flip of the switch. Fractured beams of light shoot through the edges of the lamp to mimic a pair of dramatic antlers. Constructed from folded aluminum and steel, this elegant lamp gives a classic and timeless feel that makes it adaptable to a multitude of environments. Want one of your own? There's still time to nab a lamp at a discount price over on Bikovski's Kickstarter!